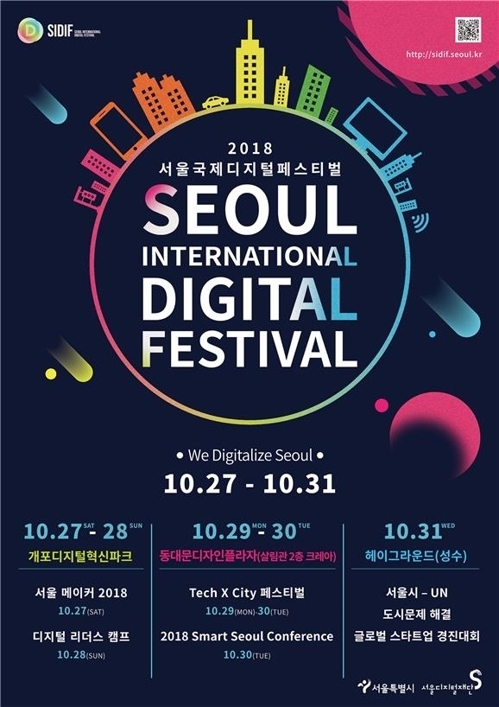 The Seoul International Digital Festival, organized by the Seoul Digital Foundation, will open on Oct. 27 at Gaepo Digital Innovation Park and Dongdaemun Digital Plaza for a five-day run, according to the city government on Friday. The third SIDiF features forums and contests held under the slogan “We Digitalize Seoul,” in an effort to share insights and discuss the use of digital technology to resolve urban problems. The event kicks off with the “Seoul Maker 2018” session, which allows teenage participants to imagine the future of a digital city, followed by the “Digital Leaders Camp” on the second day, when they can get a taste of computer education programs. Both sessions will be held at the GDIP. The “Tech X City” session will take place on the third and fourth days, featuring activities related to digital technologies, such as an online election system using blockchain and digital drawing books. The consultative group will become the channel through which the Seoul Digital Foundation and urban innovation organizations from other nations, including those from Europe, the United States and Malaysia, communicate and cooperate. A startup contest will be held on the last day. Thirty companies will compete with ideas on how to achieve the United Nations Sustainable Development Goals.